After Sandiganbayan found Former First Lady and Ilocos Representative Imelda Marcos guilty of graft and ordered her arrest on Friday, Nov. 9, anti-Duterte and anti-Marcos celebrities shared on Facebook their opinions, including Jim Paredes, Leah Navarro, G. Toengi and Juan Miguel Severo. 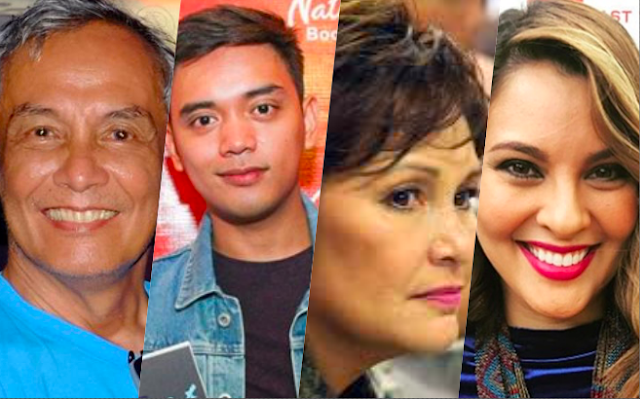 Singer Jim Paredes was content to know that Marcos has been found guilty. “I will retweet every news about this. She is a THIEF. Let us at least get this satisfaction even if she may never spend a second in jail,” he said. “Let us see how this Imelda being found guilty stuff plays out the next few days. Watch with caution. Too many forces on her side that do not respect the law,” he added. Singer Leah Navarro also shares her opinion and her expectations. “Imelda can’t be incarcerated because she’s over 80. 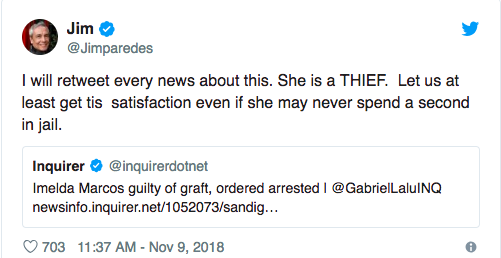 No matter, because from now on, even if she wins her appeal (she’s got a chance under a Duterte SC), I can confidently call Imelda Marcos a Thief!” she said. 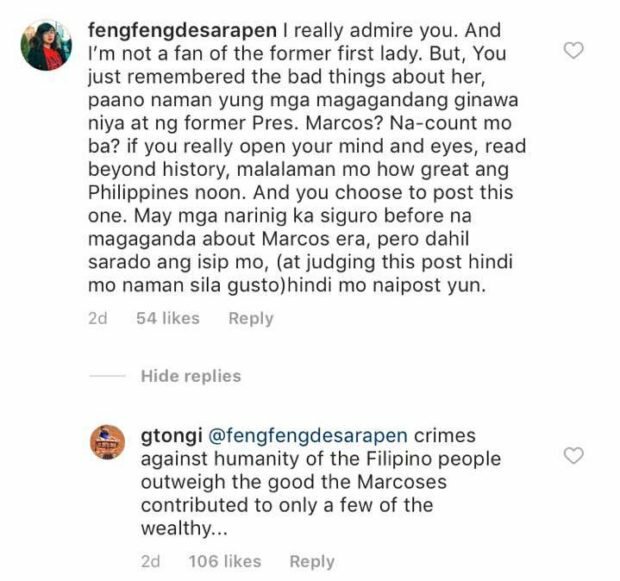 Netizen One Feng G. (@fengfengdesarapen) claimed she wasn’t “a fan of the former first lady,” but wondered, “You just remembered the bad things about her, paano naman yung mga magagandang ginawa niya at former Pres. Marcos? 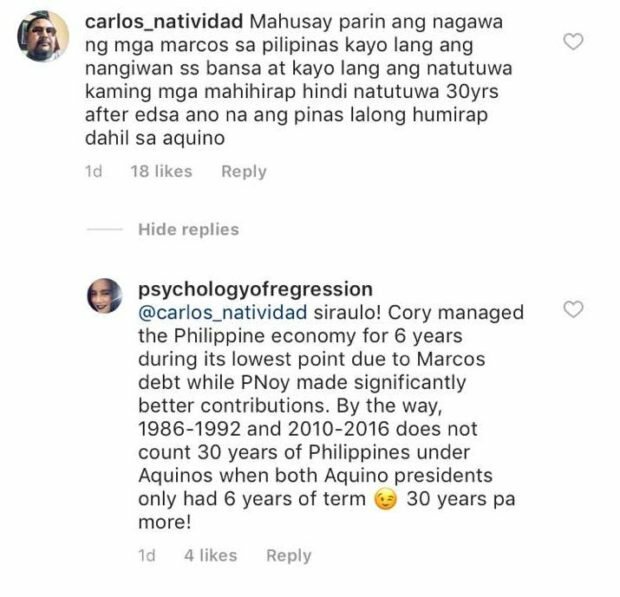 If you really open your mind and eyes, read beyond history, malalaman mo how great ang Philippines noon," the commenter said. Other netizens, including Agnes Maureen Mutia (@maureen_arjan) slammed Toengi for her statement against Pacquiao. 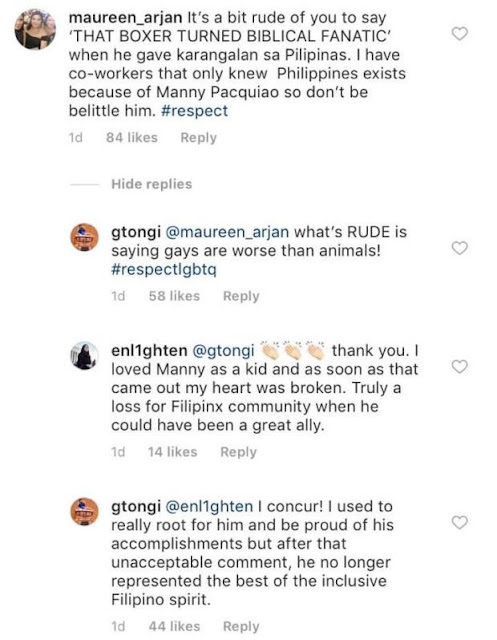 “What’s rude is saying gays are worse than animals!” the actress replied.